Stencil art created by Drew Brophy Street art executed by Jim Bowes. Guest Post by Jim Bowes. 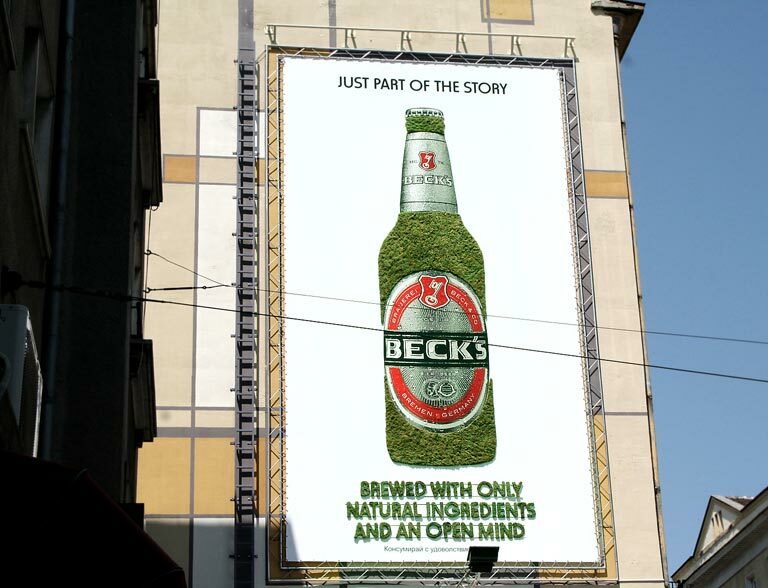 Natural media is used to produce outdoor advertising campaigns that have a lower impact on our planet while having a higher impact on your audience. Traditional outdoor advertising not only has a huge negative impact on our environment but it also can be expensive. Natural media has been used in Europe for many years and is now making its way to North America. It’s been used by established brands like Nike, Timberland, KEEN Footwear, Sony, LG, Heineken and Sonos that are dedicated to lowering the environmental impact of their advertising activities but it is also perfect for SMEs, NGOs and cities themselves. They are affordable and many are perfectly suited for businesses that want to do it themselves. 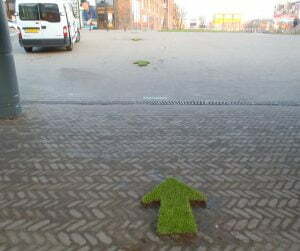 Natural media are a collection of communication techniques that use water, sand, snow, moss, grass, chalk, and milk paint to produce communication messages. 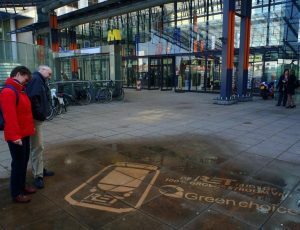 The most popular technique is known as “reverse graffiti” or “clean advertising.” Using only a template, water and a power washer, messages are literally cleaned out of the dirt – no paper, no plastic, no toxic inks, no electricity for front or back lighting and very little waste. One template can be used hundreds if not thousands of times. 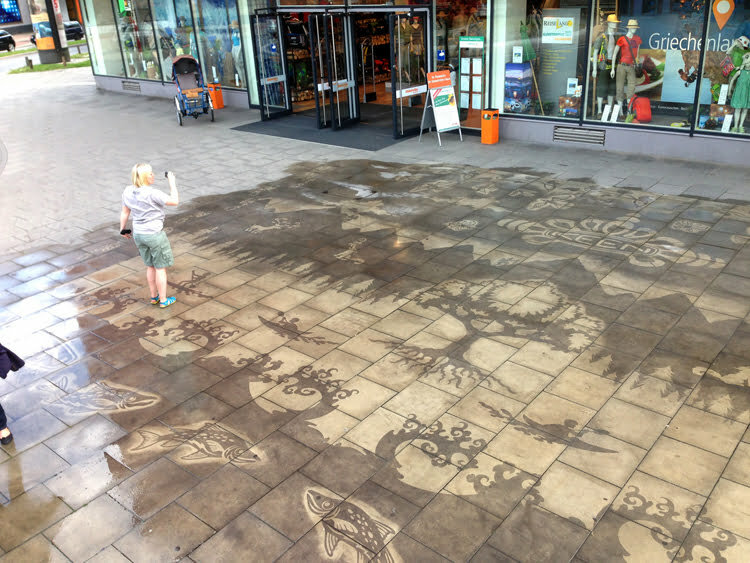 Reverse graffiti uses precious water but it uses less than 1/10th the amount of water that it takes to produce a piece of paper of a comparable size. Many natural media companies compensate for the water they use by contributing to water projects around the world. 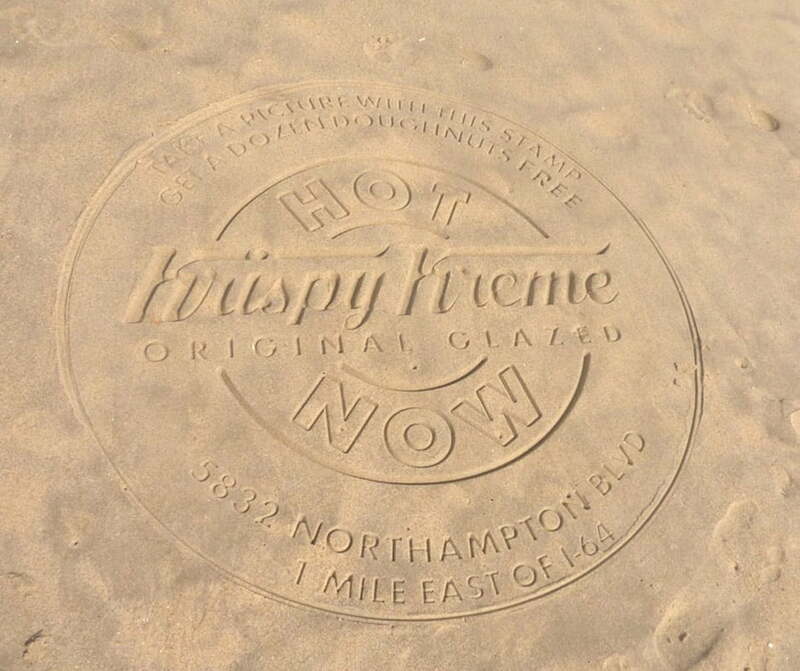 Another popular technique is sand printing where an image is created when a mixture of sand and natural binders is pushed through a screen that is attached to template. Sand printing is a cross between silk screen and rangoli printing. When the sand mix is activated by water, when it dries it forms a bond adhering to the surface. Chalk and milk paint are also popular. Which material is used depends on how long you want your messages to last. Sand prints can last up to a week or two while milk paint and some chalk paints can last up to several months. Flowers, plants, moss and grass are ideal for posters, signage or “living billboards.” These are usually adhered to a template and trimmed producing stunning communication pieces. 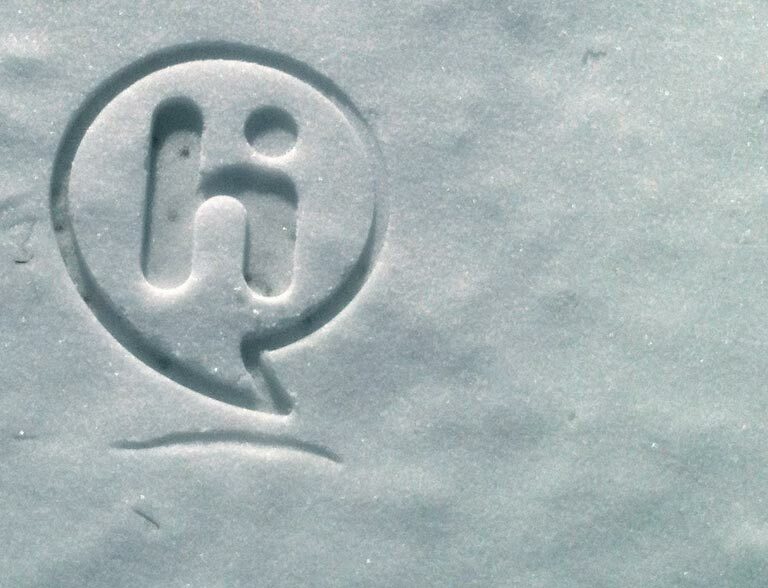 Sand and snow stamping are easy to use techniques that are somewhat temporary but placing them is so quick that one person with a stamping template can place hundreds of images a day. 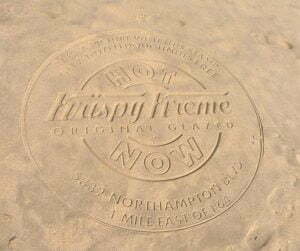 Sand stamping at beach. Image courtesy of EarthStamps. The natural media industry is growing quickly and there are many companies you can hire to execute your campaign for you. These companies have the equipment and the knowledge and will normally charge you per “impression.” Natural media campaigns are affordable. But the real beauty of many of these techniques is that you can produce campaigns yourself if you have the right tools, materials and the spirit. For a few hundred dollars you can execute your own outdoor campaign and take advantage of this very effective form of communication. If I can figure out how to use these techniques, believe me anyone can do it! Natural media techniques are not new. Most have been around for decades or centuries. Milk paint was used to paint cave walls. 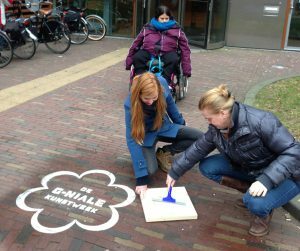 If you have ever written, “wash me” on a dirty car, you have already used “reverse graffiti” or “clean advertising.” Sand stamping was used in hotel ashtrays to produce hotel logos. What is new about these techniques is how they are being used for marketing and advertising purposes. There are some challenges that the natural media industry is working hard to overcome and risks you need to be aware of. Natural media is in a legal grey zone so to speak. There are no laws against cleaning a public space. Municipalities would be hard pressed to arrest or fine you for organizing sand into a shape that your eye recognizes as a letter or an image. However, there are some valid concerns about monetizing the public space. 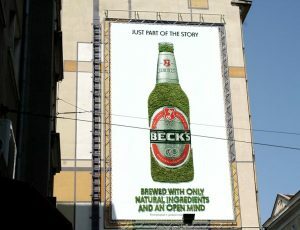 Billboard made of moss for Becks Beer. For those of us who like to challenge the way the system works, getting in trouble can be the best possible outcome if you are prepared for it. Why? Because getting into trouble for being a responsible business, acting in a way that matches or fulfills the sustainable ambitions of almost every country, city and town is at best a waist of the civil servants time and at worst hypocritical. We have had clients that were thrilled to get into trouble. I wouldn’t be surprised if they got themselves in trouble because they had a strategy and public response in place. Even a simple strategy like contacting the local press to innocently apologize for using sustainable media can work wonders. You are after all, just trying to be good corporate citizens almost forced to use natural media because the outdoor media companies who have a virtual monopoly on our cities do not offer any sustainable forms of media you can use. Getting into trouble for being a good corporate citizen is a story most journalist love to tell. If your goal is to generate attention for your business than landing on the front page of the local newspaper will make sure 100 times more people will see your campaign than those that past by it physically. A whooping success by any measure, with the worse case scenario being you are asked to return and remove the messages by simply washing them away leaving the side walk cleaner than before you arrived and who doesn’t like clean! Sand stamping brand awareness campaign for HI. Natural media can be even more effective when it combines art with brand experience. If we are buying more from brands we like, then winning our hearts is a far better approach than hawking products. By using the urban landscape as the canvas and mother nature as the brush, you are practicing what you preach and demonstrating in a tangible way that you are authentically dedicated to reducing your impact on the environment. Advertising and marketing are key ingredients to a successful business. 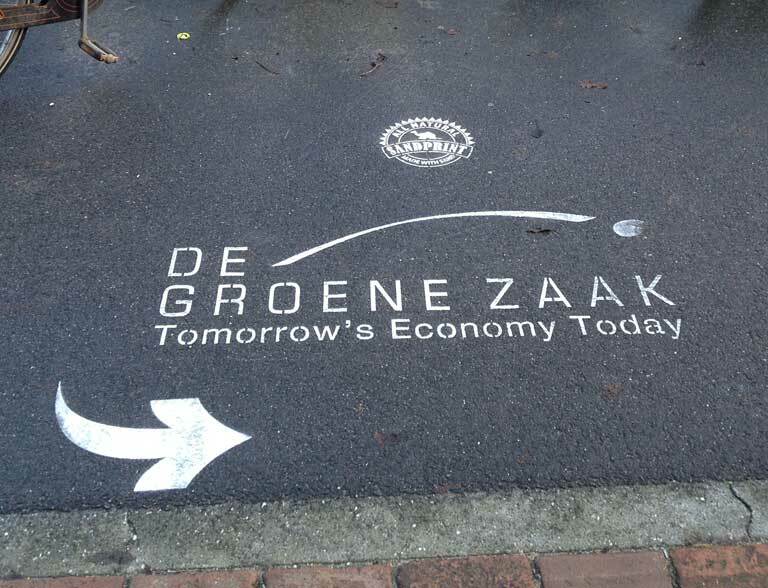 Natural media techniques make it easy for you to promote your company in a way that has a lower impact on our environment and if done in an esthetically pleasing and clever way it can have a much higher impact on your target audience. 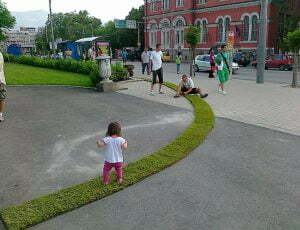 One kilometer grass path placed in Sofia, Bulgaria to promote Aroma products. 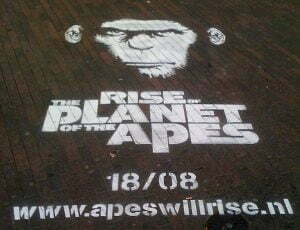 Chalk advertising place for Warner Brother Studios in Amsterdam. 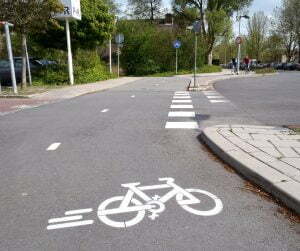 Bike symbol made from Milk Paint. 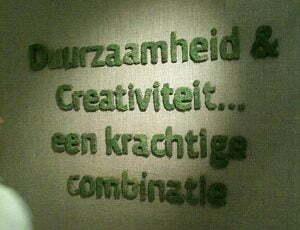 Moss signage made for sustainable tradeshow. Sand printing at day event. Reverse graffiti used for outdoor advertising. 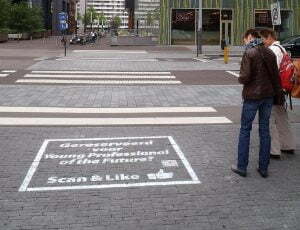 Milk Paint used for student campaign in Amsterdam. Jim Bowes grew up in Northern California and now lives in Amsterdam, the Netherlands. He left the traditional advertising industry ten years ago with the mission of reducing the impact of advertising on the environment. He founded GreenGraffiti one of the first natural media companies and has recently started a new consulting firm called Natural Media Experts to promote the young natural media industry, teach advertisers and creative’s how to use natural media to its fullest potential and to help others set up their own natural media companies. 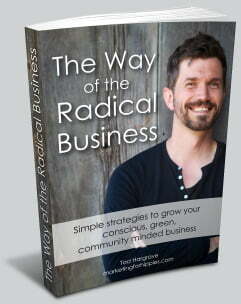 He is widely recognized as an authority on natural media and has been invited to speak at TEDx Warwick. You can reach him by email at .